NICOLE & EELTSJE F. (BOB) Are Rockin’ the 2013 Grand Prix! Our Grand Prix dressage show season is off to a fantastic start with Nicole and Bob doing incredibly well! They began the 2013 season by winning both of their Grand Prix Open tests with 66.3% and 66.4% at the Rocky Mountain 1&2 show in Longmont, CO. 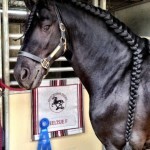 This was their first competition of the 2013 season, so it was a wonderful way to begin the show season! Our next competition was the High Prairie 1-2-3 at the Colorado Horse Park in Parker, CO. Again they dominated the Grand Prix with 2 first place wins scoring 65.9% and 67.1%. 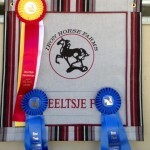 They also earned the coveted USDF Reserve FEI High Point Champion ribbon for both competition days! I CAN’T TELL YOU JUST HOW PROUD WE ARE OF THEM BOTH! So excited for this Grand Prix season and can’t wait for the next show! Hugs to all that continue to love and support Nicole & Bob! You mean the world to us all!